Skills and Abilities: She has great knowledge of past flashes, their villains, histories etc. 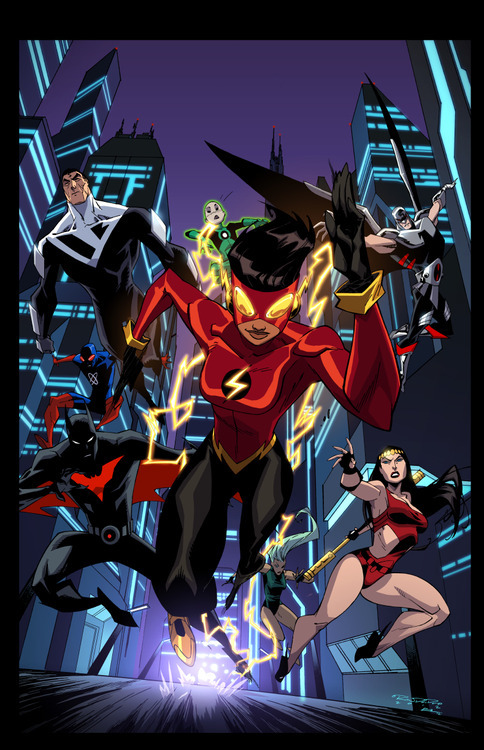 Powers: Access to the Speed force allows her to run and move at superhuman speeds. Her speed force connection also allows her to communicate with past speedsters like Jay Garrick, Wally West and Bart Allen. Danica’s father was a brilliant engineer working for Cyborg in the “Batman Beyond Universe”. In her early life her family moved around allot from Metropolis to crime filled Gotham and finally settled in Central City how to the Flash. Also of note is that she was born with a connection to the speed force and could always hear the voices of past speedsters. Her first meeting with the Justice League Beyond found her saving them from the villain Mindslide. She was then offered membership and joined the team [Justice League Beyond #20]. She serves alongside John Stewart/Green Lantern’s son Warhawk and black superhero Micron.